C/Col James J. Wyatt is presented Spaatz Award #1458 by Spaatz Association National President Brig Gen Richard Anderson. 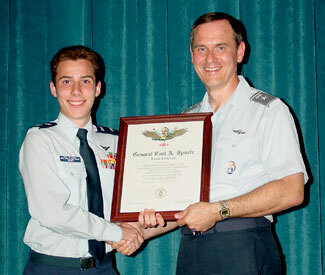 New Jersey Wing’s C/Col James J. Wyatt received Spaatz Award #1458 at ceremonies during the 2002 Tri-Wing Cadet Summer Encampment at Camp Fretterd, Maryland. Encampment Commander and Spaatz Association National President Brig Gen Richard Anderson, Spaatz #193, presented James with his award certificate.